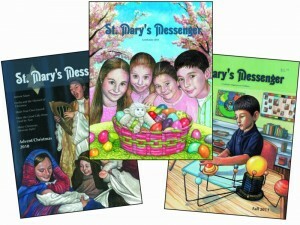 If you had read last Easter’s issue of St. Mary’s Messenger magazine for children, you would have known that. I recently stumbled upon St. Mary’s Messenger through a phone call from Kris Weipert. She had come across my name by putting “Catholic” and “North Dakota” together on an internet search. Being a writer with those credentials, my name popped up. Her family was considering a move and she had heard good things about North Dakota. She just wanted to visit about that. Although I love to write, I’ve never had the slightest desire to shoulder the responsibility of getting a magazine published. So, I’m impressed on many levels. If you are as curious as I was as to what sort of barefoot-and-pregnant mom manages to homeschool and publish a magazine in her spare time, read on. The family currently lives in the state of Washington and attends Sts. Peter and Paul church. Her children, four boys and four girls, are ages three to 20; the oldest is away from home attending Wyoming Catholic College. Baby number nine is expected to join the family next April. The idea for the magazine began with a novena to St. Theresa of Lisieux while her kids were attending a Catholic school. “I felt there was a need for a children’s magazine to offset influence of secular magazines and fit their needs,” explained Kris. “Adults have so many more resources to choose from.” After the novena, the inspiration to publish a Catholic version of Highlights came to her. The idea took shape when Kris put together a team to donate everything from art and graphics to printing. The first issue, “All Saints” 2005 was born with 1,000 copies distributed to schools and parishes in the Salem, OR area where they lived at the time. This first endeavor made two things clear: people loved it, but it needed professional support. After a move to Washington, Kris put together another on-line issue and had staff at the University of Steubenville evaluate it. More good feedback led to two trial mini issues in 2009 sold as inserts with the Catholic Digest. The first full-sized 32-page magazine was born, fittingly, on Christmas of 2010. One time, when Kris was thinking of how to explain the concept of Jesus present in the Tabernacle, she prayed to the children of Fatima for inspiration. The idea of comparing the tabernacle to a treasure box holding the most special thing in our Catholic faith came to her. Magazine content sometimes comes from contributors and has led to some fun coincidences. For instance, twin girls from Tacoma wrote a story about their pet rabbits for Easter. After it was published, one of the girls was doing virtual school for writing class and a classmate from Georgia asked if she was the girl in the article he had read. The magazine is a slice of Catholic life from a child’s perspective. “We utilize what we have around us from our own children and parishes for inspiration,” said Kris. Some favorite articles were Joe McDermott’s sword-making article and another one about a Catholic teacher/coach who always picks silly nicknames for his students such as: Awesome Alex, Jumpin John, Honest Anna Maria, and Maddie Mo. It’s a magazine for kids and by kids too. And if you count the prayers and divine inspiration that Kris says she depends on, it’s also a magazine for God and by Him too. Subscriptions for this quarterly magazine are $1 9.95 a year. Go to http://stmarysmessenger.com/ to learn more.